Residents of West Texas generally appreciate the abundance and importance of cacti in the Chihuahuan desert but one genus, or group, of cacti have become valuable all over the world, yet few Americans appreciate it. The group is so common, in fact, that many Texans consider it a pest. The cacti we are talking about are the prickly pears. They are probably the most common cacti in Texas. 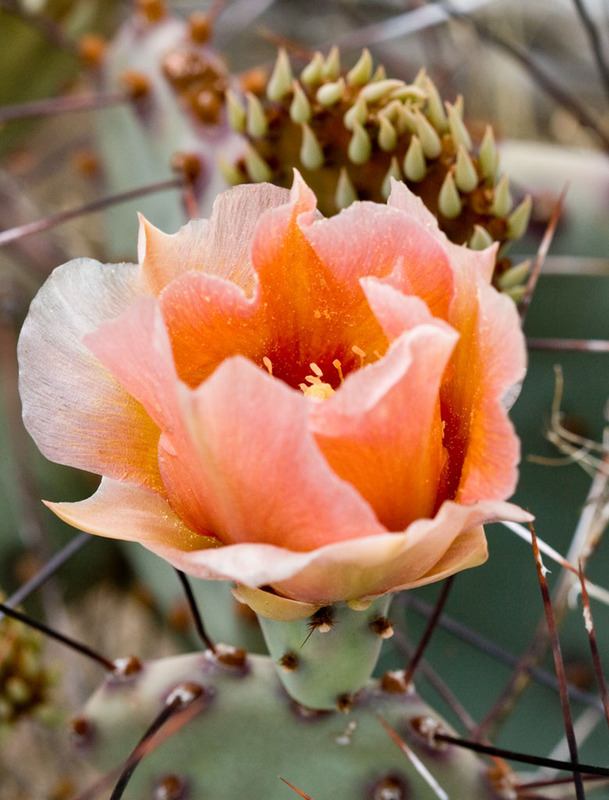 So treasured are the blossoms that the prickly pear was seriously considered for status as the state flower of Texas. The battle between prickly pears and bluebonnets was fierce and highly political. Even after bluebonnets won the fight, a struggle continued for over 70 years as to which bluebonnet should be the state flower. Archaeological evidence documents the fact that humans have been using these plants for over 9,000 years, but cultivation probably began as early as 1000 BC. Prickly pear has always been valuable as a food plant, providing browse for livestock and fruit and vegetables to poor people around the world. 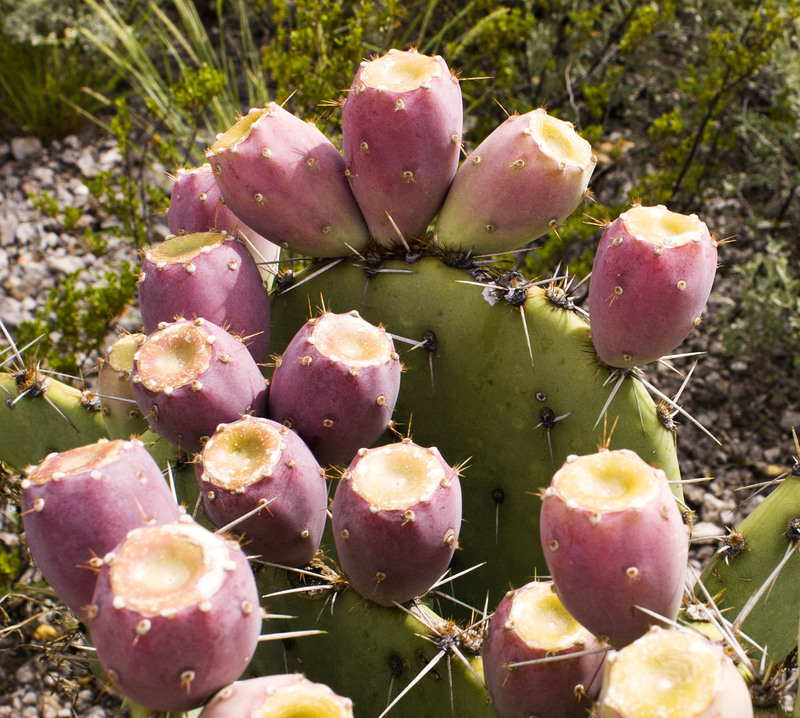 Unlike Sotol and Lechugilla, prickly pear may be eaten without being roasted in a pit for days – trans-Pecos tribes ate it whenever they could. 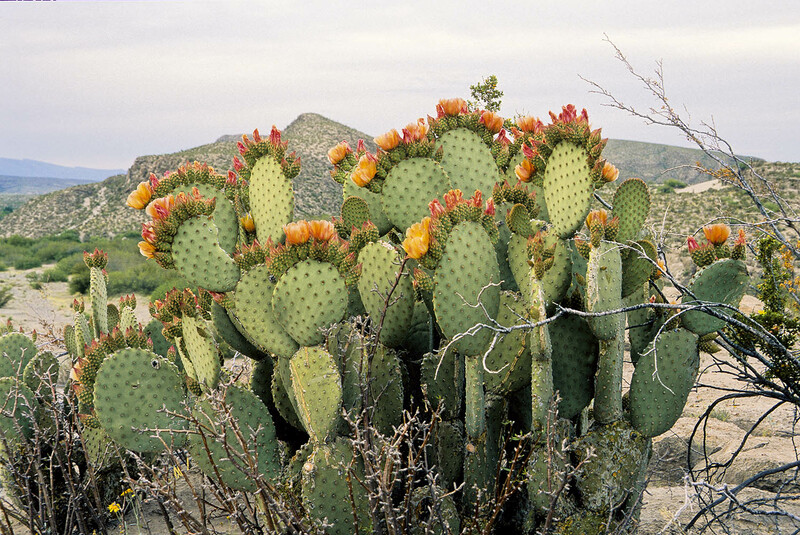 Throughout Mexico and the Southwest, people cook prickly pear in a wide variety of ways. They slice, blanch, marinate, boil, fry, and pickle the pads. They make them into soups, stews, drinks and salads. They fry them with other vegetables, and season them with chiles, onions, tomatoes, pumpkin seeds and even chocolate. Prickly pear pads are rich in vitamin A and fiber. They are said to help control diabetes and to reduce the so-called “bad” cholesterol, LDL. The fruits are even more valuable than the pads – they were Moctezuma’s first gift to the invading Spaniards, who found them quite tasty and who regarded them as figs. 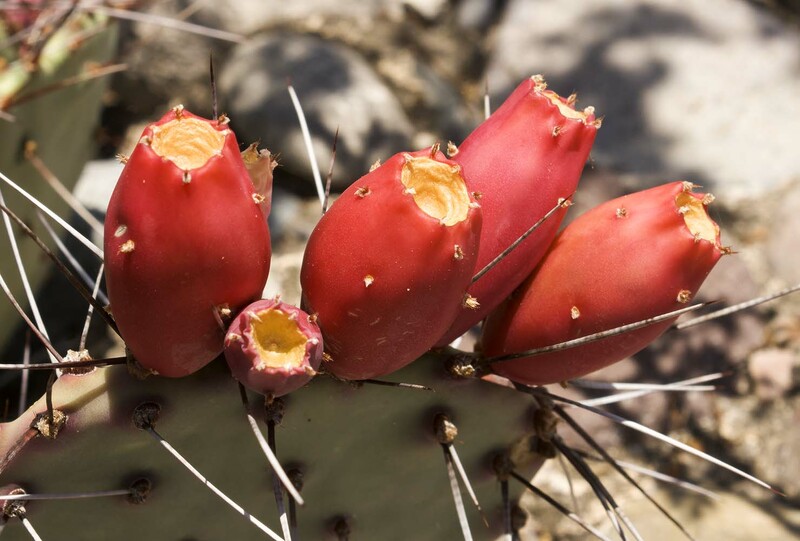 Prickly pear was widely cultivated; pre-Columbian codices describe where and how to collect the plants, how to cultivate them, and how to create cultivars with particularly tasty fruits. Some of these cultivars are grown even today. The fruits, called tunas by native American tribes, were crucial for survival. Warring tribes declared an annual truce known as the Truce of the Tunas during tuna season when people often subsisted on prickly pear fruit for two or more months. Today tunas are popular around the world. They are eaten fresh, dried, pickled, and fermented; they are reduced to make syrups, jellies and preserves. In Mexico they make a cheese called queso de tuna. Tuna finds its way into salsas, candies and alcoholic beverages. And though the seeds are tiny, they too are collected, ground into flour or meal, and used in drinks, gruel, stews and tortillas. Sicilians grow prickly pears as a cash crop, for forage in dry years, and for use as fences around vegetable gardens and vineyards. So important is this plant in Sicily, it is known as the bread of the poor and the blessing of Sicily. Prickly pear is equally appreciated in north Africa, particularly in southern Tunisia, where it used in desertification control programs to prevent soil loss, accumulate wind-borne deposits, and reduce land degradation. Planted alongside Acacia and Atriplex species, prickly pears have proved quite effective; since the early 1950s between 700,000 to 1,000,000 hectares have been planted in Tunisia, Algeria, and Morocco. From earliest times, prickly pear have been cultivated as much for an insect pest that relies on it as for the plant itself. The insect is known as Cochineal. These insects produce and store in their bodies a predator deterrent, carminic acid, which happens to be a brilliant red. The color is extremely pure, bright, and stable – it has always been precious. Conquered cities were required to pay it as tribute to the Aztecs, and after the Spanish conquest it began to be exported to Spain. By the end of the 16th century Spain imported 70,000 to 90,000 kg of dried insects per year and traded it as far away as India. Aided by the Spanish monopoly which strictly forbade exporting the insect, cochineal rapidly became one of the most valuable substances on earth. Costing only slightly less than silver or gold, its price was regularly quoted on the London and Amsterdam Commodity Exchanges and it became Latin America’s second most valuable export. Cochineal dye remains valuable today, even with the advent of synthetic dyes. Though widely cultivated it remains a precious commodity – global annual production runs only slightly over 1,000 tons per year. This may seem like a small number, but the scale of the effort is enormous. You can better appreciate the price – about $35 per ounce in art supply stores – when you learn that it takes over 70,000 insects to make a one pound of dye. 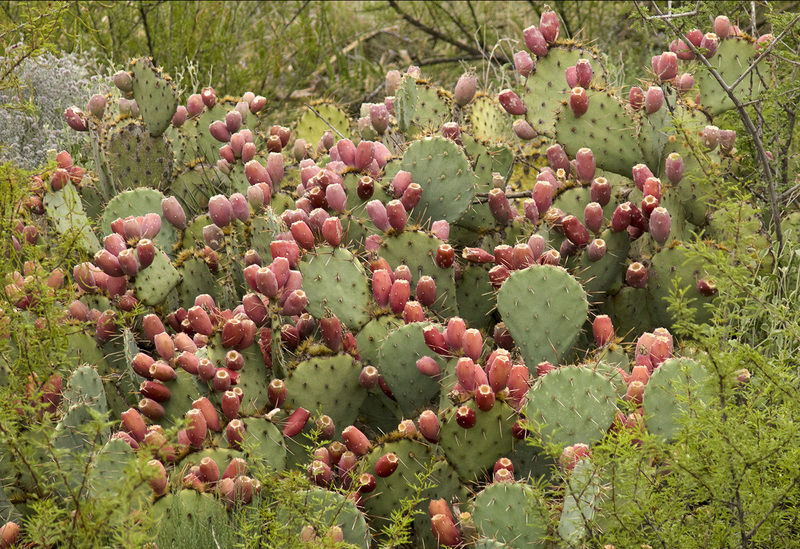 Prickly Pear are one of Texas’ greatest treasures and one of the finest gifts of the Chihuahuan Desert. Very interesting article indeed of a cactus that is very common and disgaurded here in North Florida. I’ve recently collected close to 300 seeds that i intend on planting soon. As always, informative article, and beautifully illustrated! I want some of that queso de tuna! 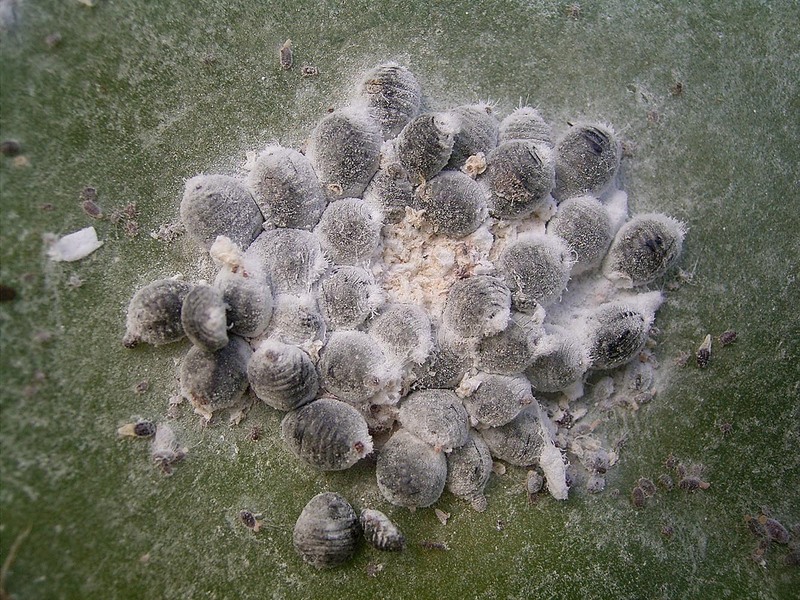 With all the cochineal I see on the Opuntia plants between Abq and El Paso, looks like I could make some $!!! Seriously, an informative article, and yes, an underappreciated and even maligned plant. Impressive and well written. Too often I underestimate this plant for aesthetics issues. However, there is no doubts as to its value for humans, flora and fauna.